Why purchase heat shrink tamper evident security bands from Blue Line Labels? Our quality polypropylene film, prices and ships the same day is just a couple of reasons. Heat seal bands prevent customers from opening your product without leaving visible evidence of tampering. Security neck bands shrinks to a snug and secure seal. Easy to apply and seals in seconds with a standard heat gun. Protective neck bands seals to prevent tampering of your product. 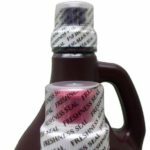 Tamper evident safety neck bands are designed to be heat sealed that will cover the entire opening of your product to prevent any tampering and insure the safety and confidence of your product for the consumer. Safety shrink seals not only prevents any tampering but can also be used in a decorative way. 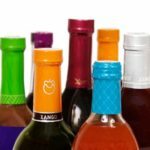 We can custom design shrink labels with up to 10 colors to provide a functional packaging design. 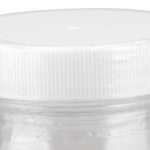 Shrink sleeve labels has an added benefit of adding a horizontal perforation in the film, running up the cap to create a tamper evident safety seals. Shrink bands can be delivered on rolls or individually cut bands are the perfect solution for manual application for small to medium product assembly. Call about our stock tamper evident products that can be cut to any to fit your specific container. Easy to applied to bottles, jars and many other containers. For larger quantities pre-formed shrink bands are made to conform to specific common round, rectangular or even asymmetrical containers for faster production. Also available, crystal clear or printed Full Body Tamper Evident Shrink Sleeves with a full vertical perforation for easy unwrapping. Optional Tamper Evident Security Labels. Tamper evident labels are intended to help detect and show proof of product tampering. 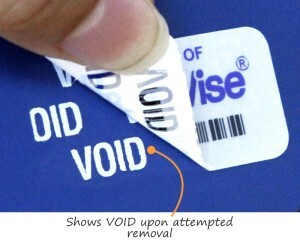 When you peel off each label the word VOID or a Checker pattern is left behind on the surface when the label is removed and provides visual security of tampering. 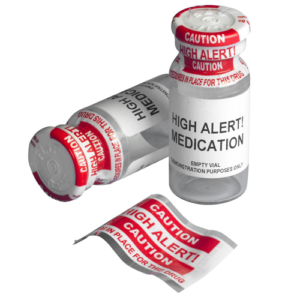 Call Blue Line Labels at 1-800-609-7079 for additional product information. Enter The Result Of: 1+99=?